It’s here! Citizens Against Government Waste (CAGW) has released their Pig Book, which concludes that since the earmark moratorium imposed in 2011, they have found wasteful pork in at least 12 appropriations bills. While the number of earmarks dropped from 109 in 2014 to 105 in 2015, the cost jumped 55.6 percent. In FY 2014, there were $2.7 billion in earmarks, while this year we’ll see $4.2 billion in pork. In the book, CAGW lists their seven-point criteria for finding pork in government spending. CAGW found that most of the things they found fit at least two points in the criteria. Going through this rather extensive menu, we find that the Delta Regional Authority, established in 2000, provides “economic development assistance to support the creation of jobs and improve local conditions for the 10 million people who reside in 252 counties… through the Mississippi Delta states.” That’s a good mission statement, but the DRA’s programs are duplicates of other federal programs that provide similar assistance. 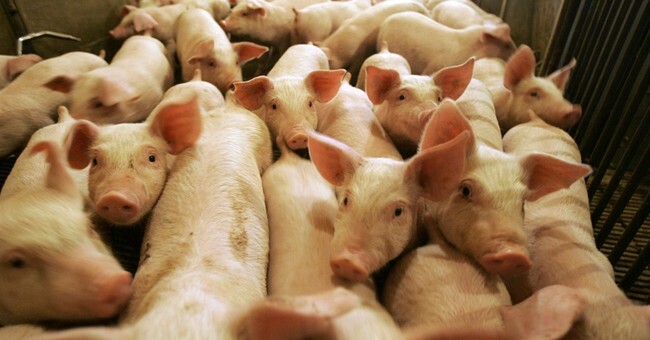 Moreover in 2003, the DRA received $17.8 million in pork spending. Since FY 2000, 20 earmarks costing taxpayers $149.5 million have been added for the PCSRF. From FYs 2008-2010, the three years in which members of Congress were required to identify their earmark requests, Sen. Murray added 575 earmarks costing taxpayers $779.5 million. While there’s more, let’s turn the biofuel initiative the Department of Defense has been haggling with since 2004, which Sen. McCain said represented a “Solyndra situation.” It’s just comes to show you that parochial interests can be incredibly expensive. At a March 13, 2012 Senate Armed Services Committee hearing, then-Ranking Member John McCain (R-Ariz.) asserted that the Navy’s efforts to develop biofuels to power its planes and ships could turn into another “Solyndra situation,” citing the solar panel manufacturer that received a $535 million loan guarantee through the Department of Energy before filing for bankruptcy in September 2011. According to Sen. McCain, the Navy spent in excess of $400 per gallon for approximately 20,000 gallons of algae-based biofuel. In a February 2011 hearing, House Armed Services Committee member Randy Forbes (R-Va.) fired a shot across the Navy’s bow, telling Navy Secretary Ray Mabus, “You’re not the secretary of Energy. You’re the secretary of the Navy.” While members of Congress took a positive step by reducing the amount earmarked for alternative energy research in the FY 2015 DOD bill by 66.7 percent from $60 million in FY 2014, this funding should be zeroed out in FY 2016. Toomey took an optimistic view, saying the reduction in the number of earmarks and the money spent on those programs has been dramatic and, given the entrenched nature of that spending, surprising. "The consensus was that this was the most ridiculous undertaking under the sun, because it was simply in the DNA of Congress to engage in that on the biggest scale it possibly could," Toomey said of past efforts to end earmarks. He acknowledged that completely eliminating government waste would be difficult, but there's still more to be done. Toomey has introduced legislation to permanently ban earmarks, though his colleagues have favored extending a moratorium as part of their rules instead. I’m still stuck on, among many, many things in this book, about the DoD paying $400 a gallon for biodiesel; that’s ridiculous. The Pig Book is a quick, though nauseating, read on how government spends wastes our money.